Did you know that Central Park was built on Seneca Village, a community of modest farms, also known as a safe haven for runaway slaves? Did you know Washington Square Park used to be a potter’s field? Author James Roman, a native New Yorker, brings to this guide an intimate knowledge and love of New York’s neighborhoods and the quirks of history that have helped shape the city. Discover 400 years of innovation through the true stories of the visionaries, risk-takers, dreamers, and schemers such as John Jacob Astor, Cornelius Vanderbilt, Stanford White, Gertrude Whitney and more with historical photographs and period maps. 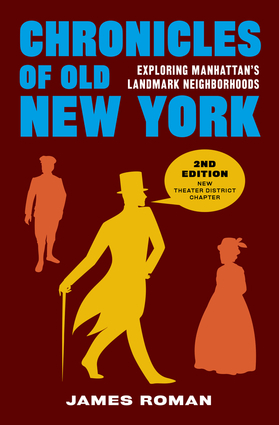 This second edition includes a new Broadway chapter and completely updated walking tours. A Must Read for anyone who loves New York City. A third-generation New Yorker, James Roman has regaled listeners with his chronicles of old New York as a real estate broker and sales manager for 15 years in Manhattan, and as a lecturer at the Real Estate Board of New York and New York University. He is also the author of Chronicles of Old Las Vegas and Chronicles of Old Los Angeles, and contributes regularly to publications that document emerging technology.